Valentine’s Day is just around the corner and who wants to celebrate with a little chocolate? Or maybe a lot of chocolate? Brookside Chocolate recently sent me a Healthy Indulgences Tasting Kit and I have one to give to you as well! Just in time for the sweetest day of the year, your kit will come with everything you need to have a delicious evening at home with your Valentine. Well, let’s be honest here- you won’t receive the kit in time for Valentin’es Day but you will have everything you need to set the table for 2 and rekindle that February 14th feeling. Take a closer look at the Crate & Barrel Stemless Wine Glasses and grab the recipe for Valentine Layered Drinks here. Use the Giveaway Entry Form above or enter the Brookside Chocolate Tasting Kit Giveaway here if the widget is loading slowly for you. This giveaway is sponsored by Brookside Chocolate. I was given 1 tasting kit to review. All opinions are my own and I was not compensated for this post. These would be great to try. Thanks for the opportunity! I could live on this chocolate. Looks so good. I want to try some! Love these. Buy them in the snack bags at Costco! These look pretty awesome. Great giveaway, for sure. I love chocolate and I would love to try these. This stuff is amazing! Thanks for the giveaway! I buy the pomegranate ones at Costco sometimes- they’re my weakness! I’d love to try the gogi berry ones- those sound great! What a great giveaway! They are perfect for snacking! I couldn’t get the tweet link in the contest entry form to work correctly, so I just retweeted your original tweet about the contest. Sorry about that. I just checked and your entry counted. 🙂 Good luck! so many things I’d like to try. Great list of prizes! Love Chocolate, Cash, & Crate & Barrel! Looks delicious!! I could live on chocolate! Looks so good! And that 3 part server- Mexican supper here we come!! I would especially love to try the pomegranate ones! Thanks for the opportunity! I love the pomegranate chocolates! Thank you for the opportunity! Love dark chocolate with blueberries! Sounds yummy, I love anything chocolate! Mmm. Who wouldn’t want chocolate and Crate and Barrel goods! Fingers crossed. Chocolate with any fruit — the best! Thanks! Great giveaway! Thanks for this chance to win. I just love those chocolates!!! Thank you for the wonderful giveaway! This is a great giveaway! Thanks so much. Awesome giveaway!!! Thanks!!! Fingers crossed. thanks for Hosting the Giveaway, all that chocolate, mmmm!! Thsee chocolates look amazing. I love chocolate covered fruit! Oh, how fun! We host a small group every Sunday night, I would love to share this with my friends! Thanks for the offer! These chocolate look so good! I keep seeing them on different blogs and now I have to try them out! I would love to try this chocolate. I’ve seen it in the stores but haven’t tried it yet. I LOVE the pomegranates but haven’t gotten to try the others yet! YUM! Great giveaway! Thanks, I love your blog. I’ve had the blueberries before, and they’re yummy! I would love to try these- they look fantastic. Would love to try these …. anything with dark chocolate has to be good! Saw these in the store the other day, would love to try them out for free. Really want to try these!! DELICIOUS! Chocolate is an almost daily necessity & I’d love to try these flavors from Brookside! So yummy and I love that serving dish! Very beautiful serving dish and Yummy chocolate, what to need more…. This looks amazing! Thanks for the chance. I love this giveaway and I hope I win! What a great valentine’s gift this would be! This is a fun giveaway! Thanks for the giveaway. I can’t believe I’ve never really heard of this chocolate before. Is it new? What a great giveaway…and just in time for Valentine’s Day! Even if I don’t win, now that I know these are at Costco, I will give them a try. Yum!! These look so good. I’ve been trying to eat healthier and that’s healthier than chocolate covered chocolate, right??? These look so good! I would love to win. I tried the pomegranate kind at my parents house and loved it! I could have eaten the entire bag. I’d love to try the others! I love chocolate! 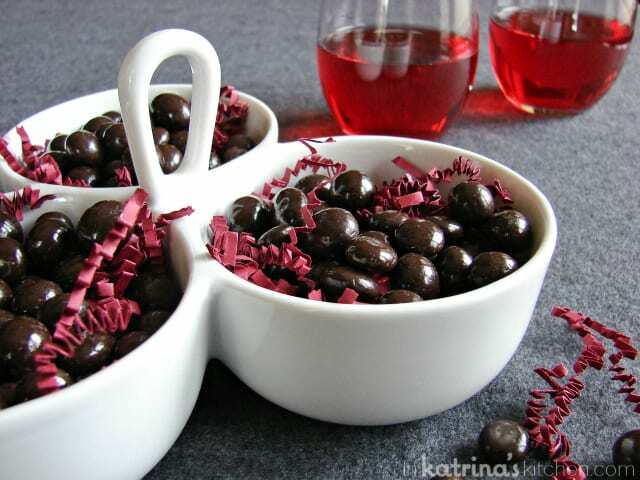 Dark chocolate and pomegranate sounds delicious!!! These look so good…LOVE chocolate covered fruit! Those chocolates would have a great home with me! These look like a yummy snack my kids (and I) would love! I am soooo a chocoholic! I LOVE chocolate covered fruit. Hell, who am I kidding? I love chocolate covered ANYTHING! This is a great combination of items. The chocolates look delicious! Love this chocolate! Thanks for offering the chance to win. What’s not to love about chocolate??? I would love to win this because I love chocolate. Thanks for the chance to enter. Awesome giveaway, would love to win!! These look yummy, I hope to get the chance to try them! Thanks for the opportunity. I love fruit and chocolate combos! Cheese and chocolate! No better combination! I’d love to try the Dark Chocolate Acai with Blueberry! I love your site it is so fun! It has so many fun ideas! I also totally love the Brookfield Acia berries! They are my favorite! Good luck on your awesome site I hope it does very well. What a wonderful giveaway! I would love to try these. I’m always up for trying new chocolates.. I would love to try this chocolate, looks great! I never thought I would like such fruit with chocolate, but I tasted it and it is GOOD!!! I still hate orange and chocolate, but other fruit… delish!!! Thank you for this opportunity,looks just wonderful,would love to try.YUM! OOOOOOO these look soooo good! Marvelous giveaway. The chocolate sounds delicious. Yum! My family would put all of this to good use for sure! Nice contest. Would love to try! This is amazing for Valentine’s Day! And any day at all, so hungry for delicious chocolates now! I love chocolate! These look delicious! Chocolate rules! Thank you so much for the giveaway! looks delicious! thanks for sponsoring this cool contest. I would love to win!!!!!!!! So delicious! I hope to win! I am a chocoholic. I need this chocolate,I want this chocolate. Please!!!! Yumm!! 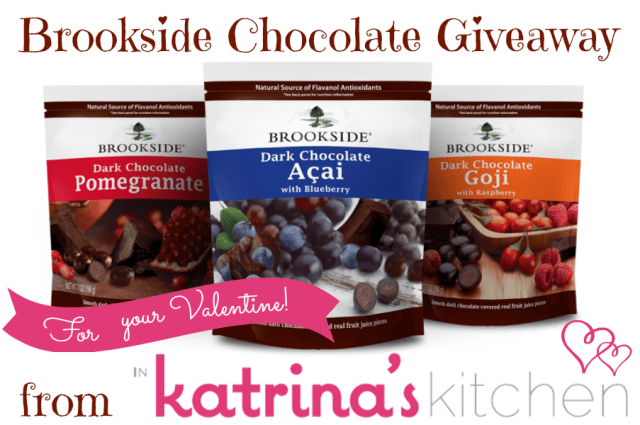 I wanna win some delicious Brookside Chocolate!! Everything looks so beautiful (and tasty)! This will satisfy the chocolate monkey on my back. What a great prize..Brookside is delicious and you can even get them in individual bags (I do!) only 100 calories! you had ne at healthy chocolate. I would love to try these – they look yummy and healthy. Yum, I’ve been dying to try these! I can’t resist chocolate and would love to try these. Delish! These look wonderful ~ thanks so much for the contest! Who doesn’t love good chocolate? I just found this website! The desserts are some of the best I’ve seen, so I’ll be back! The eleven ladies In my office would go crazy over this stuff! Great giveaway! Thanks for the chance – looks delish! I have tried the blueberries and they are delicious!Thanks for the chance! Drooling! Would love to eat these! I found these at my local CVS and the blueberry one is amazing…I would love to try the other flavors. These are so delicious and healthy too! What a awesome giveaway, thanks! I love the stemless wine glasses! I’ve always wanted to try Acai and Goji. Yum. I have been wanting to try this. I never tried Acai before; hope I win some. Awesome giveaway – count me in!!! Awesome prize! Thanks for the opportunity to win! Chocolate – it goes with EVERYTHING! I love chocolate and to think these are good for you too! I love Brookside products! Great giveaway, thanks! I’d love to win chocolate covered good stuff. Nice giveaway…the boys at my house love their chocolate! This chocolate would satisfy any craving! THANK YOU..IM IN IT TO WIN IT,AND IT LOOKS GOOD.. Yummy!! I would love to win this!!! I’d love to try the pomegranate flavor. They look great! Would love to try them! Ive been looking at these chocolates and wanting to try them. They look great! Thanks for the mouth watering giveaway. Love to try these chocolates! Great contest, I LOVE dark chocolate!! These are yummy! Thanks for the chance to win! Chocolate + yoga headbands +C&B products = some of my favorites! great giveaway! Dark Chocolate is the BEST!!!! I love all of the items in this prize… everything looks wonderful! Thanks for the giveaway!! Love your site. There are some beautiful dishes to try and love the chocolate. This would make a great present for my valentine! Thanks for offering the yummy prize! These sound so good…would love to try them! They sound delicious! I would love to try them! Now’s a good time to learn to like dark chocolate! I’ve seen the dark chocolate pomegranate ones before but not the acai or goji..yum! Can’t wait to try them. I love dark chocolate! Thanks for the super generous giveaway! chocolate goes good with everything. Really hope I get to try these soon! Especially the Goji berry. Good and good for ya! First time here and I love all the colorful food! I’ll be back often. Chocolate is great and I hope I win but there are so many equally great items here. Chocolate is always a winner. THanks for the great giveaway! They look delicious! Would love to try them!! My tastebuds sure hope I win! These would go fast in my house! I’d love to try the blueberry with acai! mmmmm sounds like just what I need! I can taste the chocolate now! I would love to try the chocolate covered goji berries they sound like a healthier alternative to the decadent chocolate I’ve had from holidays. And I appreciate you holding this giveaway too. I’m originally from Maine—-need to try the ones with BLUEBERRIES! Thank you for the contest. great giveaway. these look really good. Whoever came up with the idea to match chocolate up with some “superfoods” transforming the final chocolate product into health food should win a nobel prize in chemistry. They’ve got my vote! I love any and all things chocolate!!! Looks like a lot of goodies. Thank you! Wonderful prize, even healthier chocolate! Love chocolate – add fruit – sure why not! I’m sure I’ll love them all! I love these. They are such a great snack! Thanks for a chance at a nice prize. I would love to try these chocolates. This chocolate sounds amazing, can’t wait to share it! I have tried the acai and pomegranate and I love them, I’m excited to try the goji flavor. Who doesn’t love some chocolate!!! This chocolate is one of the main food groups – right? Thought so. I could live on it!